Welcome to Alexander Animal Hospital! We provide the best care for your best friends! Stop in and see us today! In 2013, Dr. Eric Alexander, DVM opened Alexander Animal Hospital in his hometown of Severna Park, Maryland. Since then, we have proudly served our community as a local, family-owned practice. With three doctors and six veterinary technicians on staff, we have the privilege of really getting to know our patients and their owners. Quality, compassionate, professional care is what we do best. If you’re looking for a veterinarian in Severna Park, Pasadena, Arnold, or surrounding areas, look no further than Alexander Animal Hospital! Vaccines and wellness exams: Like you, your pets need to have their regular physical exam and vaccinations too. Make sure they come in to see us at least once a year. Lost pet microchip ID: Your pet should always have their collar with license and tags, but if something should happen to them, all of their information can be stored on the microchip so they can make it home safely. Dental care: Just like you need your dental exams, we recommend that your pet’s teeth be examined at least once a year to prevent decay and other related issues. Surgical Services: We also perform surgical procedures for our patients. Whether routine, elective, or emergency, we make sure that pet owners are kept up-to-date on how the procedure is going and we present clear after-care instructions. After hours on-call emergency services: Health emergencies can be extremely stressful. That’s why Dr. Alexander will be available for on-call emergency services Monday-Saturday from 6pm until midnight and Sundays from 9am until midnight by calling the office directly at 410-777-8678, so your pet can come to a familiar place and be treated by their own doctor. Raising a pet can sometimes be a lot like raising a child. After all, your pets are your babies! And just like with children, there may be some situations where you just don’t know what to do. Well, Alexander Animal Hospital is here to help! 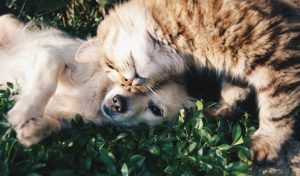 We have lots of helpful links on our website’s “Links & Resources” tab, for everything from dog and cat breed information to adoption and beyond. We will also have fun and informative weekly blog posts. If it’s time for your pet to have a checkup, you can also make an appointment and we will be happy to answer all of your questions. This entry was posted on Friday, January 18th, 2019 at 10:28 am. Both comments and pings are currently closed.